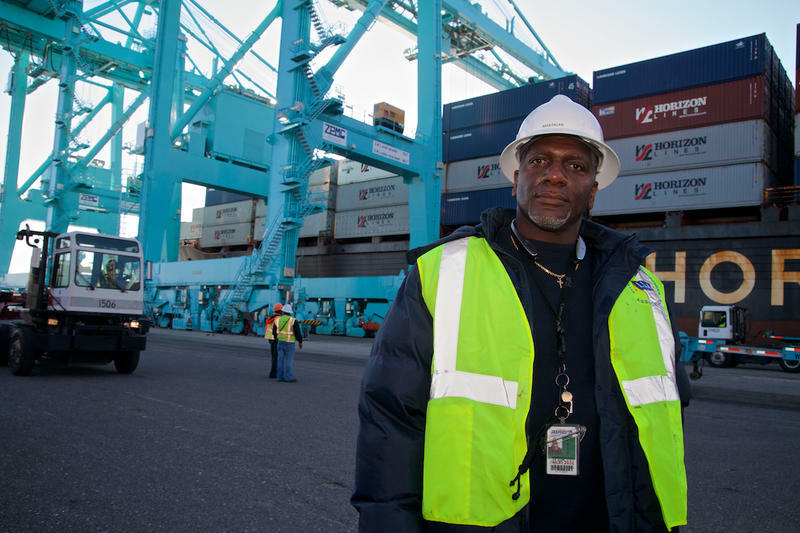 Vince Cameron, President of International Longshoremen's Association Local 1408, has worked on the docks of the Port of Jacksonville for over three decades. “My father was a longshoreman for 44 years before he retired,” said Cameron. Fifty-gauge electric cranes hoist shipping containers off a Horizon Lines freighter from Puerto Rico at the Port of Jacksonville. 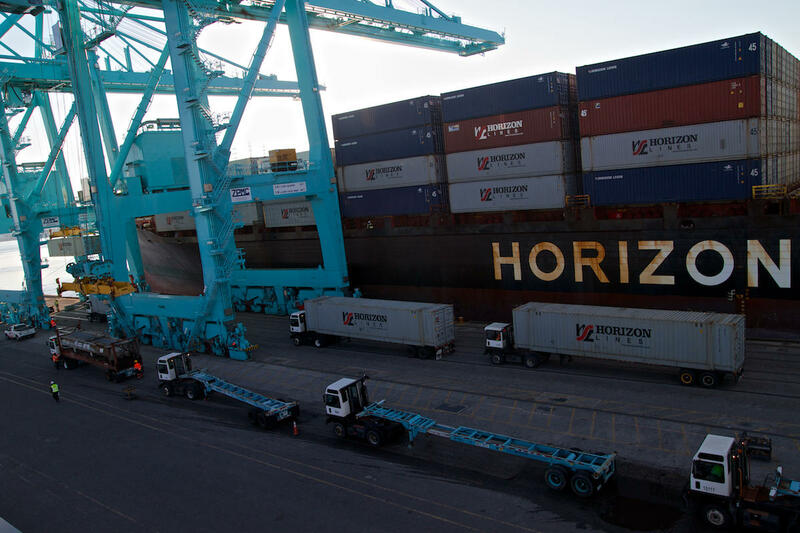 Trucks line up to receive shipping containers from a Horizon Lines freighter at the Port of Jacksonville. 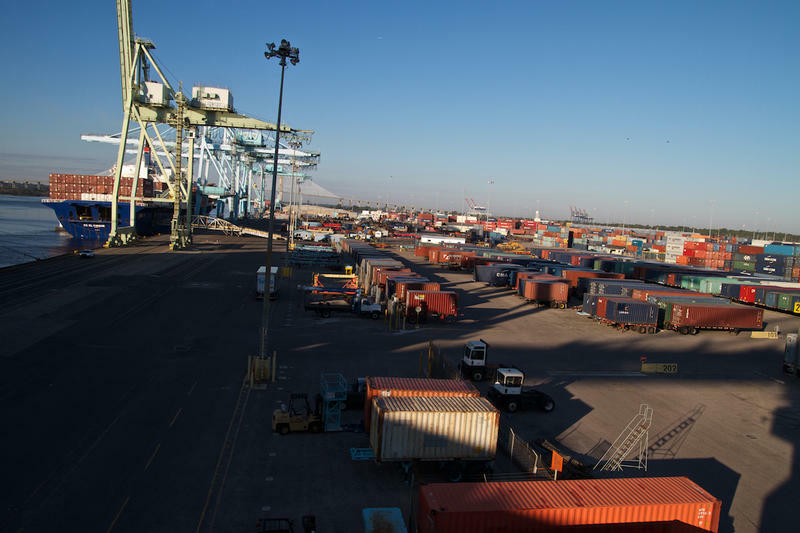 Containers wait for transport at JAXPORT's Blount Island Terminal. 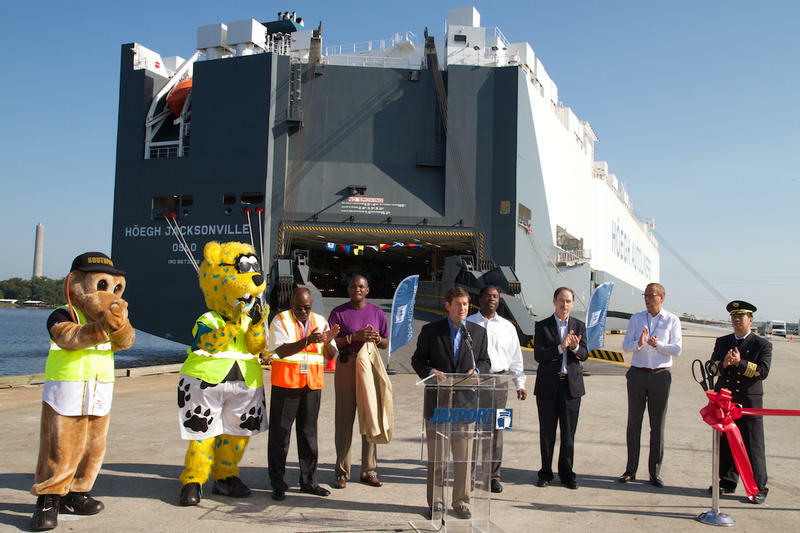 Officials unveil the new $70 million autoliner Höegh Jacksonville at JAXPORT on Aug. 22, 2014. The crew of the Höegh Jacksonville make preparations to set out for the Middle East. 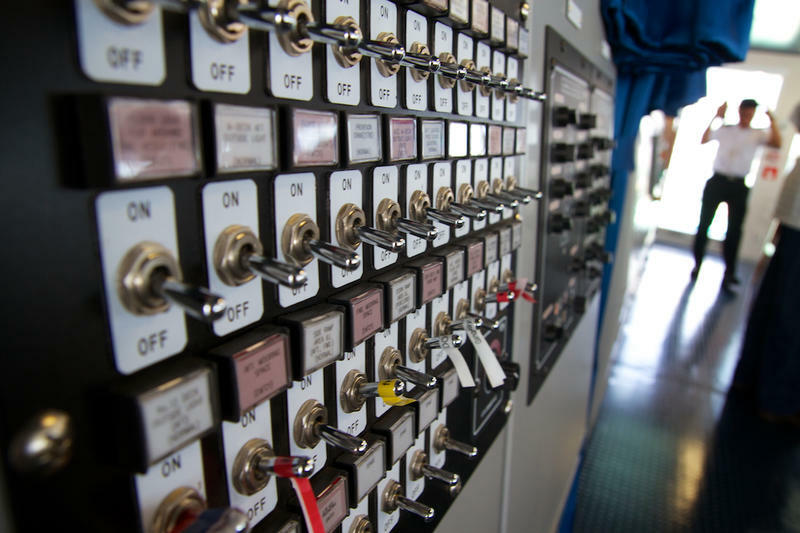 The bridge or “wheelhouse” of modern shipping vessels is complex and highly automated. University of North Florida Professor David Jaffee suggests competition between ports fueling massive dredging projects up and down the East Coast doesn’t make sense. “It’s insane,” said Jaffee. The Port Task Force, appointed by Mayor Alvin Brown, U.S. Army Corps of Engineers hears a presentation on the harbor deepening by U.S. Army Corps of Engineers Col. Alan Dodd. 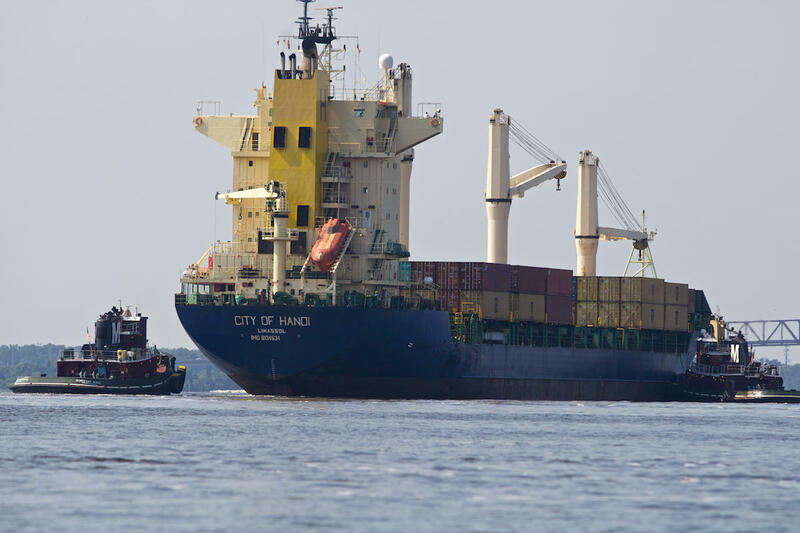 Tugboats guide a container vessel on the Jacksonville harbor. 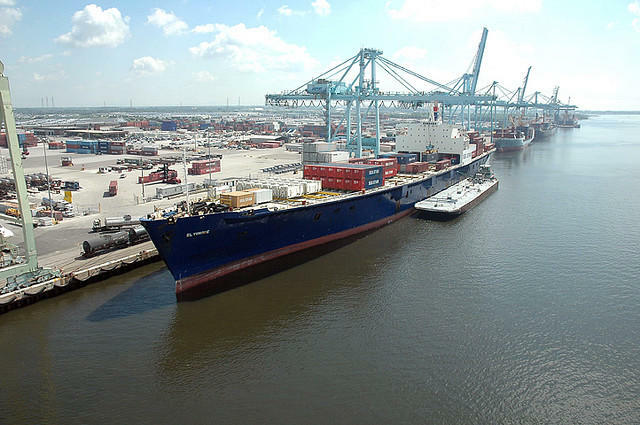 The Port of Jacksonville is pushing a $700 million plan to deepen the harbor - allowing it to accommodate cargo ships from Asia that are 5x larger. There are a lot of folks working the docks at the Port of Jacksonville. And Vince Cameron knows them all. He wears a hard hat and a whistle around his neck. He’s the President of the local Longshoreman’s union. "My dad was a longshoreman for 44 years on these docks before he retired," said Cameron. "Yeah, I’m a child of this port." He stood looking at a weathered Horizon Lines freighter that just pulled into the Blount Island Terminal from Puerto Rico. "This is a baby in the whole scheme of things," said Cameron. "It’s a good ship, but she’s kind of slow. She uses diesel fuel. I mean, she drinks it like water." These small ships are falling out of favor on some routes. When the Panama Canal expansion is finished—possibly next year—a new generation of colossal, super-efficient container ships sailing from Asia will be able to squeeze through the canal and deliver goods directly to East Coast ports. These massive ships require deeper harbors. 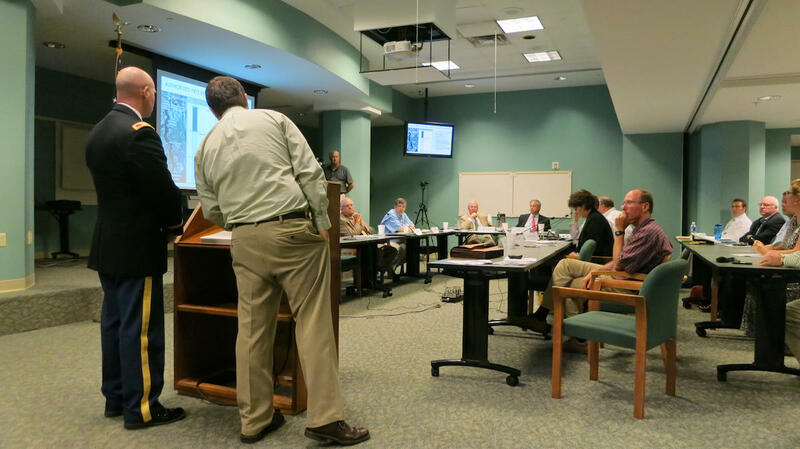 The people of Jacksonville are debating whether to go all-in on a $700 million dredging project. Down on these docks, the decision is clear. "It’s a do or die kind of thing for this port," said Cameron. "What will happen is, you’ll have ports that will be in the Super Bowl of commerce, and you’ll have ports that will be niche ports. And once we have decided that we’re not going to dig out the ditch, widen the channel to accommodate the new vehicle which is going to be bringing this cargo from Asia - then we’re saying we’re not going to be part of the Super Bowl of commerce." If Jacksonville can’t accommodate the big ships, Cameron fears they’ll go to Savannah and Charleston. At stake is millions of containers of Asian cargo and the jobs that go along with moving them. Jacksonville still has to find around $150 million in local funding for the project. Savannah and Charleston have their local funding secured. So there’s no choice here, according to JAXPORT CEO Brian Taylor. "When it comes to deepening the harbor, there is no Plan B," said Taylor. "If we do not deepen this port, and Savannah moves to 47 feet, we will lose the jobs and the volume and the opportunity to the state of Georgia." 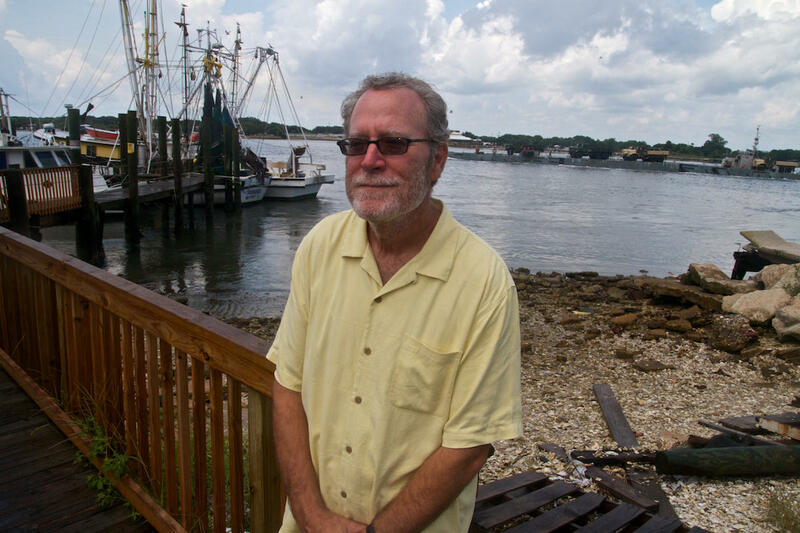 The demise of the port is something no one in Jacksonville wants to see, including University of North Florida Sociologist David Jaffee. He is an outspoken critic of the port deepening. "Do I think the port is important for Jacksonville? Yes," said Jaffee. "Do I think it's important to the local economy? Yes. Does it create jobs? Yes. But when you want public investment to the tune of what I believe ultimately will be $1 billion, you need to be very clear about what impact the port has." Jaffee says officials exaggerate the economic impact of deepening the port. He suggests Jacksonville can remain viable as a niche port for trade with Latin America, which doesn't use the giant ships. Others question whether the big ships will come to Jacksonville even after the port is deepened. "That’s the $60,000 question," said Eric Kulisch of American Shipper magazine. "Nobody knows exactly what the ocean carriers are going to do." And then there’s the cost issue. City Councilman Jim Love, like most of the council, wants the port deepened, but coming up with the funds to do it will be no picnic. "With the tight budget, we have to figure out how to find the money. Because it is a big number." Jacksonville is already struggling with a budget crisis. The city owes more than a billion dollars to police and firefighter pension funds. A special task force is considering ways to fund the port project. The City Council is expected to vote on the funding next spring. 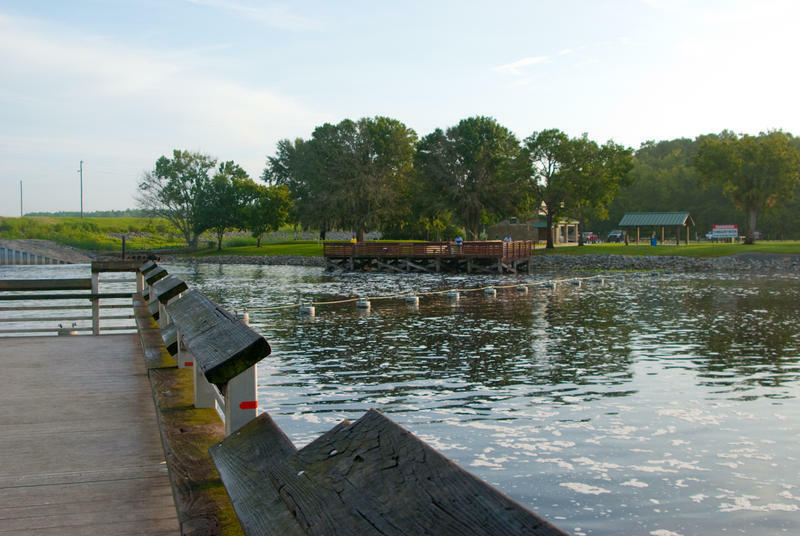 Mayor Alvin Brown’s Port Task Force has voted in support of breaching a Putnam County dam as an offset for proposed deepening of the Jacksonville Harbor. A coalition of Jacksonville business and environmental advocates say removing the dam will flush millions of gallons of fresh water into the St. Johns River each day. They say that would offset environmental damage caused by the proposed dredging of Jacksonville’s port. Meanwhile, advocates for keeping the dam, and the man-made lake behind it, say it acts as a water filter keeping pollution from flowing downstream. Starting soon, the Nestlé food company will begin shipping its Puerto Rico exports out of JAXPORT. 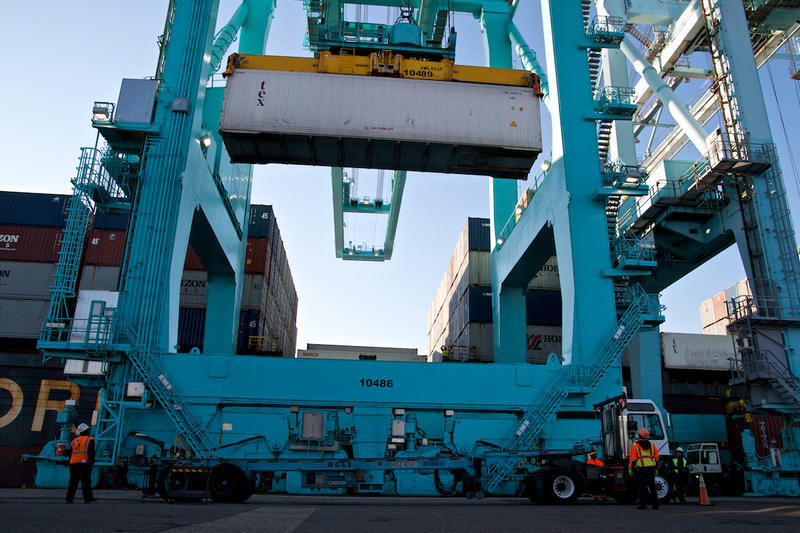 Florida Governor Rick Scott announced the company’s shift to Jacksonville’s port Monday in California. Scott met with Nestlé reps while on a trade mission there. According to a statement from Scott’s office, Nestlé expects to increase exports to Puerto Rico by at least 400 percent over the next six months. The company currently ships to the U.S. territory from ports in New York and New Jersey. Jacksonville Mayor Alvin Brown’s port task force voted this week in support of deepening the Jacksonville Harbor and increasing offsets for environmental harm that may result. What they did not decide was how to pay for the projects. The task force voted seven-to-one that dredging the port — from 40 feet to 47 feet to accommodate Asian “megaships” — makes good sense for the city. They estimate $380 million must come from state and local governments but stopped short of outlining a funding plan.